Mostly cloudy with maximum temperatures reaching 21 degrees during the day. The 2014 British Grand Prix (formally the 2014 Formula 1 Santander British Grand Prix) was a Formula One motor race held on 6 July 2014 at the Silverstone Circuit in Silverstone, United Kingdom before a crowd of 122,000 people. It was the ninth round of the 2014 Formula One season, and the 48th edition of the British Grand Prix to be held as part of the Formula One World Championship. The 52-lap race was won by Lewis Hamilton for the Mercedes team, from a sixth position start. Valtteri Bottas finished second in a Williams car, with Daniel Ricciardo third for the Red Bull Racing team. It was Hamilton's fifth victory of the season, his second at Silverstone, and the 27th of his career. Hamilton's teammate Nico Rosberg recorded the fastest lap in qualifying to start from pole position. The race was suspended for one hour and five minutes because of a heavy accident involving Kimi Räikkönen that left a section of guardrail barriers needing repair. At the restart, Rosberg led for 18 laps as Hamilton moved to second. Hamilton led for six laps after Rosberg made his only pit stop for tyres and took it from him on the 29th lap when Rosberg retired from gearbox trouble. Thus Hamilton was unchallenged for the remainder of the Grand Prix and won the race by more than half a minute from Bottas in second and Ricciardo held off McLaren's Jenson Button in the final laps to take third. The result of the race left Rosberg as still the Drivers' Championship leader with 165 points but his advantage over Hamilton was reduced to just four as a consequence of him not finishing the Grand Prix. Ricciardo and Fernando Alonso of Ferrari maintained third and fourth respectively, and Bottas advanced past Red Bull driver Sebastian Vettel and into fifth. In the Constructors' Championship, Mercedes held a 158 point lead over Red Bull and Ferrari was third. Williams moved ahead of Force India for fourth with ten races left in the season. The 2014 British Grand Prix was the 9th of 19 scheduled races of the 2014 FIA Formula One World Championship and the 48th edition of the event as part of the Formula One World Championship. It was held at the 18-turn 5.891 km (3.660 mi) Silverstone Circuit in Silverstone, Northamptonshire, England on 6 July. Tyre supplier Pirelli brought the white-banded Medium "option" and the orange-banded Hard "prime" dry-compounds to the race along with two wet-weather compounds, the intermediate and full wets. The drag reduction system (DRS) had two activation zones for the race: one was on the Wellington Straight that links the Arena and Brookands turns, and the second was on the Hangar Straight between Chapel and Stowe corners. After the 2013 race, artificial grass was removed at the exits at three of the track's turns, the left-hand side barrier at the entrance to Brooklands corner was enlargened, and multiple areas on the circuit had their drainage improved. Coming into the race from Austria two weeks earlier, Mercedes driver Nico Rosberg led the Drivers' Championship with 165 points, ahead of his second-placed teammate Lewis Hamilton with 136 points. Daniel Ricciardo of the Red Bull team was third with 83 points, and Ferrari's Fernando Alonso followed close behind in fourth with 79 points. Sebastian Vettel, in the second Red Bull car, rounded out the top five with 60 points. Mercedes were leading the Constructors' Championship with 301 points; Red Bull placed second with a total of 143 points accumulated. Ferrari (98 points), Force India (87) and Williams (85) were in close contention over the battle for third position in the standings. Susie Wolff was the first woman to drive in a Formula One race weekend since Giovanna Amati in 1992. After a recent spate of errors by Hamilton during the season's last four rounds which left him 29 points behind his teammate Rosberg, the Mercedes non-executive chairman Niki Lauda spoke of his belief that this would motivate Hamilton to perform better at the British Grand Prix and saw no reason to guide him after his recent form, "Lewis will fight back, there is no worry on my case about this at all. He is not in any way disturbed. He will keep fighting. Don't worry." Valtteri Bottas said his team had the objective of running strongly at their home event and sought to build on the momentum from the previous round in Austria, "I am really looking forward to Silverstone. It's always a great event and means a lot to us as it's the team's home Grand Prix, so hopefully some of the guys from the factory can come up and support us as well." Ricciardo said the more he became accustomed to the circuit, the more satisfied he was with the Arena section of the track, and stated he was looking forward to the race, "I know a lot of the guys are going to be watching at the track so I'll be going at it for a good result." There were four driver changes for the first practice session. Williams development driver Susie Wolff drove for the team in lieu of Valtteri Bottas. In doing so, she became the first woman to take part in a Formula One Grand Prix weekend since Giovanna Amati's qualification attempt for the 1992 Brazilian Grand Prix. Force India confirmed on 25 June that Daniel Juncadella, the team's reserve and simulator driver and Mercedes-Benz Deutsche Tourenwagen Masters racer, would make his first Formula One race meeting appearance in Nico Hülkenberg's car at Silverstone. Former GP2 Series competitor Robin Frijns participated in Kamui Kobayashi's Caterham for the second time in the 2014 season after the Bahrain Grand Prix in April. For the fourth time in the year, Giedo van der Garde took Adrian Sutil's Sauber seat. Felipe Massa crashed heavily at the exit of Stowe corner in the first practice session. Three practice sessions—two on Friday and a third on Saturday—were held before the Sunday race. The Friday morning and afternoon sessions lasted ninety minutes each; the third, one-hour session was held on Saturday morning. In the first practice session, Rosberg set the day's fastest lap with a time of 1 minute and 35.424 seconds, followed by his teammate Hamilton. Alonso, Ricciardo, Kimi Räikkönen, Vettel, Jenson Button, Daniil Kvyat, Jean-Éric Vergne and Kevin Magnussen rounded the session's top ten drivers. Felipe Massa ran onto some artificial grass at the exit of Stowe corner and was sent backwards into a sideways spin and hit the inside tyre barrier at 130 mph (210 km/h) four minutes in. This halted the session for 17 minutes since his heavily damaged Williams FW36 car stopped near the entry to the pit lane and was recovered by track marshals. Later, Wolff's engine shut down after completing four laps due to a oil pressure problem and Marcus Ericsson spun at Becketts turn. After the session, Ricciardo and Rosberg were summoned to meet the stewards in their office for overtaking Alonso and Kvyat under red flag conditions. Both were deemed to have driven safely under Article 40.8(h) of the Sporting Regulations after examining data and their explanations convinced the stewards not to penalise them. Hamilton used soft compound tyres to record the fastest lap of the second practice session with an early time of 1 minute and 35.508 seconds although his running was curtailed because his engine cut out with half an hour to go and could not improve his time. Rosberg was 0.228 seconds off his teammate's pace in second and Alonso placed third. The Red Bulls of Ricciardo and Vettel were fourth and fifth. Rounding out the top ten were Bottas, Button, Magunssen, Räikkönen and Vergne. The left-hand side of Bottas' engine cover became loose with five minutes remaining because of a localised explosion that tore through the car's bodywork. Vergne's left-front wheel became detached at Abbey corner and he stopped at the side of the track for recovery. On Saturday morning, FIA race director Charlie Whiting adopted a "zero tolerance policy" and cautioned drivers not to run wide leaving Copse and Club turns otherwise their lap times would be deleted unless they were deemed to have been forced wide. Overnight rain made the track wet and a north-westerly wind was a factor for drivers in the final practice session as four drivers chose not to set a timed lap and some went off the slippery track. Vettel set the fastest time of 1 minute and 52.522 seconds. His teammate Ricciardo was second and Pastor Maldonado third. Romain Grosjean, Sutil, Kvyat, Magnussen, Button, Bottas and Räikkönen completed the top ten ahead of qualifying. Jules Bianchi broke his front wing in an impact with the barrier at Stowe corner as Sutil avoided doing the same as he got out of the gravel trap. Nico Rosberg had the fourth pole position of his season and the eighth of his career. Saturday afternoon's qualifying session was divided into three parts. The first part ran for 18 minutes, eliminating cars that finished the session 17th or below. The 107% rule was in effect, requiring drivers to reach a time within 107% of the quickest lap to qualify. The second part of the qualifying session lasted 15 minutes, eliminating cars that finished 11th to 16th. The final part of the qualifying session determined the positions from first to tenth, deciding the pole position. Cars who progressed to the final qualifying session were not allowed to change tyres for the race's start, using the tyres with which they set their quickest lap times. The track was damp but worsened as rain began falling with increasing severity during intermittent periods, and all drivers used intermediate compound tyres for the first two qualifying sessions. Rain stopped falling at the start of the third qualifying session and drivers used dry tyres in its first minutes but rain soon returned and they returned to the pit lane. However, several drivers returned to the circuit with three minutes left for one last try at improving their laps. Rosberg took his fourth pole position of the season and the eighth of his career with a one minute and 35.766 seconds lap. He was joined on the grid's front row by Vettel whose best lap was 1.6 seconds slower after he bowed out of his first try because of the rain. Third-placed Button made an error at Aintree corner and oversteered on the run to the Hangar Straight and began from the top three at Silverstone for the first time since the 2005 British Grand Prix. Hülkenberg briefly held pole position as he was the first to improve his lap on the drying track but he fell to fourth and Magnussen was fifth. Hamilton held provisional pole position after all first timed laps but he elected to abandon his final attempt because he was slower in the first two sectors and he felt the track was not dry enough to allow for improved lap times. This dropped him from first to sixth. Romain Grosjean was the first of the 22 drivers not to qualify within the top ten positions. Sergio Pérez started from seventh after he ran wide at Chapel turn, which lost him all tyre temperature and he was required to allow faster cars through. Eighth-placed Ricciardo did not anticipate the improvement in track conditions and he remained in the pit lane. The Toro Rosso duo of Kvyat and Vergne rounded out the top ten starters. Grosjean was the fastest driver not to advance to the final qualifying session because a yellow flag at Brooklands corner meant he had to slow. Marussia fuelled their cars for the second qualifying session and reacted to the changing weather conditions which had Bianchi qualify 12th and Max Chilton 13th fastest. However, Chilton was issued a five-place grid penalty for changing his gearbox after third practice. Esteban Gutiérrez lost traction in his vehicle on the kerb leaving Brooklands corner and he was sent backwards into the guardrail at Luffield turn. He had the 14th-best lap but he was also demoted five places on the grid for changing his gearbox. Maldonado was 15th on the provisional grid but a fuel pressure problem during the second qualifying session required him to stop his car and he was demoted five places for not providing the FIA with at least a 1 l (0.22 imp gal; 0.26 US gal) of fuel for analysis. Hence, Sutil started from 13th after he lost control of his car's rear and was beached in the gravel trap. The Williams pair of Bottas and Massa began 14th and 15th due to a strategy error that had them drive on a wet track on dry compound tyres. Alonso (who spun at Brooklands turn) and his teammate Räikkönen were also caught out by the mixed weather conditions and used the incorrect tyre compound due to Ferrari spending more time deciding their strategy and began 16th and 17th. The Caterhams of Ericsson and Kamui Kobayashi could not get their cars up to speed and failed to qualify within the 107% rule but they were granted dispensation from the stewards to start the race. ^1 — Max Chilton was given a five-place grid penalty for unscheduled gearbox change. ^2 — Esteban Gutiérrez was given a ten-place grid penalty for unsafe release at previous round and a five-place grid penalty for unscheduled gearbox change. ^3 — Pastor Maldonado was excluded from the results for violating the rules by not having enough fuel to return to the pits, and he was moved to the back of the grid. ^4 — Marcus Ericsson and Kamui Kobayashi failed to set a lap time within 107% of the fastest lap time set by Nico Rosberg in Q1. They were later given permission to start by race stewards. Kimi Räikkönen crashed on the opening lap of the race. Crash barrier damage forced its suspension for an hour. Weather conditions at the start were dry and sunny. The air temperature was between 17 and 19 °C (63 and 66 °F) and the track temperature ranged from 33 to 39 °C (91 to 102 °F); rain was not forecast to fall during the Grand Prix. The Grand Prix was attended by 120,000 people. When the race began from its standing start at 13:00 British Summer Time (UTC+01:00), Rosberg made a clean getaway to lead on the run to Abbey corner. Vettel got off his starting position uncleanly and Button passed him for second and then by the other McLaren of Magnussen for third. Hamilton advanced from sixth to fourth as Massa stalled from 15th. On the Wellington Straight, Räikkönen slid off the track and onto the run-off area due to the rear of his Ferrari F14 T getting loose. He identified a run-off section without grass to reemerge on the track but he appeared to rejoin too fast at 150 mph (240 km/h) and with too much angle. That led to Räikkönen hitting a bump on a grass verge and it unsettled his car. He was vaulted towards the right at an angle into the guardrail barrier beside the circuit close to the pillar of an overhead bridge and made contact with it in an impact measured at 47G. The car's right-front tyre flew by Chilton's helmet due to him lowering his head to avoid being struck but his front wing and front-left brake duct were damaged. Massa went back to the starting grid but had to retire because of the heavy amount of damage to his car. 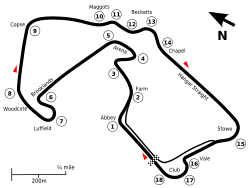 Räikkönen ricocheted across the track and into Kobayashi's and Massa's paths. Kobayashi grazed the front of the Ferrari and then veered onto the grass while Massa responded by applying the brakes at the first sight of the impact so he could manipulate his car to create his own pirouette to the right to avoid a major T-bone collision. His car spun to the right and the rear of the car made contact with the front of Räikkönen's vehicle. Räikkönen had external assistance to exit his car with hip and heel injuries as a track marshal helped him enter an ambulance for transport to the circuit's medical centre. The safety car was deployed for a lap until race director Whiting chose to red flag the race after discovering that the barriers were heavily dented and required repairs by course workers. Massa returned to the starting grid where the cars were directed to stop but the heavy amount of damage to rear suspension necessitated his retirement. In the meantime, Chilton incurred a drive-through penalty for entering the pit lane under red flag conditions. Repairs to the barrier prevented the resumption of the Grand Prix for an hour and five minutes until course workers completed the task at 14:05 local time. The race was restarted behind the safety car with the drivers in the positions held before the suspension. Both Red Bulls switched to the hard-compound tyres and Alonso decided to run on the softer compounds to improve the possibility of making a solitary pit stop. Rosberg was first, followed by the McLarens of Button and Magnussen and Hamilton in fourth. Bottas overtook Kvyat at Brooklands corner to move into ninth and Hamilton began to challenge Magnussen for third. On lap three, Hamilton drew alongside Magnussen through Woodcote turn and passed him for third entering Copse corner as Magnussen ran wide off the track. That lap, Bottas moved into seventh by overtaking Ricciardo on the Hangar Straight while Alonso got past Gutiérrez for twelfth. During the next lap, Hamilton got alongside Button and overtook him around the outside at Brooklands turn to take over second. Alonso moved ahead of Sutil for eleventh on the run to Brooklands corner and then took tenth from Bianchi as Hülkenberg lost sixth to Bottas through Stowe turn on the fifth lap. DRS was enabled on lap six. That lap, Alonso used DRS to pass Kvyat around the outside leaving Woodcote corner and completed it into Luffield turn to claim ninth. Ricciardo made an unsuccessful pass on Hülkenberg at Stowe corner and the subsequent loss of momentum allowed Alonso to get by him around the outside at Vale corner for eighth on lap seven. Marcus Ericsson retired on the 12th lap with a suspension failure on his Caterham. On lap eight, Hülkenberg was overtaken by Alonso who used DRS to get ahead on the outside at Brooklands turn after a short battle. Further back Sutil got past Bianchi for eleventh as Ricciardo battled Hülkenberg over eighth at Luffield turn on the tenth lap but he could not force him wide at Woodcote corner due to the Force India's better straight line speed. Ricciardo tried again and he succeeded entering Stowe corner. On the lap, Gutiérrez attempted to pass Maldonado on the inside at Club turn, who himself sought to overtake Bianchi, but went into the left-hand side of the Lotus. Contact continued through the corner and Maldonado was launched airborne off Gutiérrez's right-front tyre. Gutiérrez ran into the gravel trap with rear car damage and was beached in it and retired. The first green flag pit stop for tyres occurred on lap 11 as Vettel entered the pit lane to try and undercut the McLarens and released the faster Bottas to catch Magnussen. On the next lap, Ericsson's suspension failed on the Brooklands corner kerbs but he got back to the pit lane to retire. Alonso was handed a five-second stop-and-go penalty on the 13th lap because he was adjudged to have been out of position on his grid slot for the restart. Bottas had caught Magnussen and used his DRS and better speed to pass him on the outside for the entry to Stowe corner to move into fourth on the 14th lap. Alonso moved into fifth when he overtook Magnussen around the outside of Stowe corner as Ricciardo made his first pit stop for the soft compound tyres on lap 15. Two laps later, Bottas executed a carbon-copy move of his pass to the outside of Magnussen on his teammate Button at Stowe turn for third. On that lap, Sutil was passed on the approach to Stowe corner by Ricciardo for ninth. Rosberg made his first pit stop from the lead on the 18th lap. Hamilton led for six laps as the plan was for Hamilton to run the middle stint with the hard-compound tyres before his own stop at the conclusion of the 24th lap. In the meantime, Rosberg began developing gearbox problems on lap 20. As Alonso battled with Button, a stone lodged in his rear wing slot gap that remained there for the rest of the Grand Prix and he oversteered coming through Becketts corner on this lap and the lap after as Ricciardo passed Hülkenberg to claim eighth. Rosberg had increased his advantage to six seconds over Hamilton who was delayed by 1.7 seconds as his hard-compound left-rear wheel was slow to install at his pit box. On the 25th lap, Vettel set up a pass on Magnussen through Brooklands the entry to Luffield corner to get ahead for sixth at the exit to the latter turn. Three laps later, Alonso overtook Hülkenberg through Copse corner to advance into eighth after he took his five-second stop-and-go penalty. As Hamilton reduced Rosberg's lead from six to four seconds in the space of three laps on his newer tyres, the latter's gearbox problems worsened and he had gear selection problems. Rosberg made an attempt to change his gearbox's settings but this did not work as he slowed at Village corner and Hamilton took the lead on the Wellington Straight during lap 29. He steered onto the grass down the approach to Becketts corner to retire after a successful rectification of the gearbox problem could not be undertaken. With the top two positions settled, attention focused on the battle for third. Ricciardo's pit stop allowed him to convert his strategy into a one-stopper when tyre degradation rates were less than had been observed during the Friday practice sessions. Bottas made his second pit stop on the 32nd lap and emerged in third behind Vettel. Two laps later, Bottas glimpsed space to get past Vettel on the Hangar Straight and he retook second. The battle between Sebastian Vettel and Fernando Alonso for fifth in the final laps of the Grand Prix. Vettel immediately entered the pit lane for the second time at the end of the lap. He rejoined ahead of Alonso in fifth place. Vettel and Alonso duelled through the Arena complex of corners with Alonso getting ahead of Vettel around the outside at Copse corner to take fifth from him. That prompted Vettel to use DRS but he slid through Luffield corner and Alonso achieved a faster exit onto the straight and on the approach to Woodcote turn to pass the defensive Vettel around the outside at Copse corner. On lap 37, Vettel got optimum tyre temperature, and activated DRS on the Wellington Straight and passed Alonso on the outside under braking. However, Alonso held on and cut back across the front of Vettel's car leaving Brooklands corner. Vettel tried again on the 42nd lap because he saw space at Brooklands corner but his pass on the racing line was blocked by Alonso. Three laps later, Vettel turned to the outside of Luffield corner. Although he did not pass Alonso, he entered the straight faster than the Ferrari who reacted by going to the inside past the former Grand Prix pit lane. This meant Vettel could not pass Alonso before Copse turn as the latter steered left to take his approach line. Lewis Hamilton celebrating his 27th career victory in front of the crowd. On the 47th lap, Vettel executed the same manoevure and he managed to move to the outside at Brooklands corner and drew alongside Alonso through Woodcote turn but Alonso kept fifth by out-braking him. He was however helped by the rear of Alonso's car stepping out into Copse corner and made a successful pass on the outside line for fifth place. Once through, Vettel pulled away from Alonso. In the meantime, Vettel's teammate Ricciardo was being closed on by Button because the latter had made his pit stop earlier than the former and thus was lapping the faster of the two due to his strategy of making two pit stops to Ricciardo's one. Maldonado's exhaust failed and he pulled off at the side of the track at Abbey turn with smoke billowing from the rear of his car to retire on the 51st lap. Unchallenged in the final 23 laps, Hamilton crossed the finish line after 52 laps to claim his second victory at the Silverstone Circuit, his fifth of the season, and the 27th of his career to equal three-time World Champion Jackie Stewart's race wins total. Bottas followed 30.135 seconds later in second and Ricciardo completed the podium finishers in third. Off the podium, Button could not get close enough to pass Ricciardo and finished in fourth. Vettel, Alonso and Magnussen made up positions five to seven. Hülkenberg held off Kvyat to take eighth and Vergne completed the top ten. The final classified finishers were Pérez, Grosjean, Sutil, Bianchi, Kobayashi, Chilton and Maldonado. Daniel Ricciardo celebrating finishing in third place on the podium. At the podium interviews, conducted by former driver David Coulthard, Hamilton said that his weekend had demonstrated perseverance, "Yesterday wasn’t a case of giving up, I didn’t think I could do the lap, I was really shocked that the last sector was so fast. But coming here today I had my family with, just focused, the support from the fans, as I said, just spurred me on, and I really couldn't have done it without them." Bottas spoke of his enjoyment of passing other drivers and was complimentary of his team and car, "The plan was to come as high as possible, as high as the pace of the car is giving the possibility. I think as a team we made the most out of it." Ricciardo spoke of his feeling that had the race lasted one additional lap, Button would have passed him. In the subsequent press conference, Hamilton said the fans' positive attitude helped him and stated that his win had no comparison to his 2008 victory as that race was held on a wet track. Bottas revealed that Williams' prediction was that Mercedes and Red Bull would be strong opponents and the team targeted not the podium but scoring points. Ricciardo stated Red Bull restarted on the hard-compound tyres for track position, "I think all three of us had a bit of redemption on our plate today. It was a pretty dismal Saturday for us. I think we’re all pretty happy. This is definitely one of my best podiums this year." After missing the circuit's in-season test, Räikkönen was declared fit for the following German Grand Prix and he said that he felt the crash was not his largest and hoped he would avoid such incidents in the future. Mercedes non-executive chairman Niki Lauda criticised the decision to stop the race for guardrail repairs, suggesting the delay was too long and unnecessary and argued it was an example of Formula One's over-regulation, "This over-nursing of F1, being over cautious, over-controlling and over-regulating, drives me mad. This little guardrail issue is another example. There are too many people involved in making F1 as safe as the roads, which is wrong. They should have fixed it quickly, done something instantly, and then 10-15 minutes later the race would have gone on." Massa argued his belief that Räikkönen could have prevented his heavy accident by slowing and merging back onto the track more cautiously, "When you are in free practice you back off, but when you are in the race and it's like that you're trying to come back as quickly as possible and that's what he did, and he lost the car." The FIA later rejected suggestions that Räikkönen should have been penalised because it decided he did not rejoin unsafely and Whiting responded to Lauda by noting visor protection was enhanced following Massa's 2009 Hungarian Grand Prix injury from being struck by a spring. Alonso told the press he expected to lose the battle with Vettel because of his car's rear wing aerodynamic deficiencies that led to it not operating correctly and Ferrari contemplated retiring him, "Vettel overtook me by going out of the track. He finished in front, but I was very proud of my 13 laps. If he had not passed me on the lap he did it would have been the next one because we were in slow motion and they were at real speed." Vettel described a series of radio transmissions where he complained of suspected illegal manoeuvres during his duel as "silly", "I got the message that I should respect the limits and that he was complaining, so I was doing the same thing. I'm not sure who won the list-keeping. I think twice it was maybe a bit too harsh into Turn 6 [Brooklands], but it was good to get the move at the end." Nevertheless, former driver Allan McNish wrote on a BBC Sport online column that the battle was "some of the best racing you will ever see" because it demonstrated "two world champions having to really work for their living." For his accident at Club corner on lap nine, Gutierrez was issued a five-place grid penalty for the German Grand Prix because he was adjudged to have been "predominantly at fault" for the collision and incurred three penalty points on his super licence. The result of the race meant Rosberg's Drivers' Championship lead was reduced to four points because he failed to finish the Grand Prix and Hamilton's victory. Ricciardo's third-place finish enabled him to increase his points tally over fourth-placed Alonso to eleven points ahead and Bottas' second-place result advanced him past Vettel and moved from seventh to fifth. In the Constructors' Championship, Mercedes continued to lead with 326 points and their advantage over Red Bull was still 158 points. Ferrari maintained third with 106 points. Williams (103 points) moved in front of Force India (91 points) in the battle for fourth with ten races left in the season. ^ "2014 FIA Formula One World Championship race calendar". Formula One. Archived from the original on 18 June 2014. Retrieved 23 June 2014. ^ a b "2014 British Grand Prix – Preview". Fédération Internationale de l'Automobile. 2 July 2014. Retrieved 1 April 2018. ^ Rowlinson, Anthony (August 2014). "British Grand Prix stats". F1 Racing. No. 222 (United Kingdom ed.). Haymarket Publications. p. 114. ISSN 1361-4487. OCLC 476470071. ^ Esler, William (30 June 2014). "The 2014 British GP preview: Everything you need to know about this weekend's race!". Sky Sports. Retrieved 1 April 2018. ^ a b c d "Classifications". Fédération Internationale de l'Automobile. Archived from the original on 27 November 2014. Retrieved 23 July 2016. ^ Noble, Jonathan (27 June 2014). "Niki Lauda denies Lewis Hamilton is cracking amid F1 title fight". Autosport. Retrieved 1 April 2018. ^ "Great Britain preview quotes - Ferrari, Marussia & more". Formula One. 3 July 2014. Archived from the original on 7 July 2014. Retrieved 1 April 2018. ^ "Red Bull driver Sebastian Vettel upbeat ahead of British Grand Prix at Silverstone". Pulse. 2 July 2014. Retrieved 1 April 2018. ^ "After 22 years, Susie Wolff breaks F1 male bastion". The Free Press Journal. Indo-Asian News Service. 4 July 2014. Retrieved 9 September 2018. ^ "Juncadella to make FP1 debut at British GP". GPUpdate. 25 June 2014. Archived from the original on 17 March 2015. Retrieved 9 September 2018. ^ Llewellyn, Craig (1 July 2014). "Frijns to make F1 return return in Silverstone practice". Crash. Retrieved 9 September 2018. ^ "Preview – 2014 Santander British Grand Prix" (Press release). Sauber F1 Team. 30 June 2014. Retrieved 9 September 2018. ^ a b Codling, Stuart (4 July 2014). "British GP: Rosberg edges Hamilton in first practice". Autosport. Archived from the original on 17 July 2014. Retrieved 9 September 2018. ^ Benson, Andrew (4 July 2014). "Susie Wolff hits trouble on British GP F1 debut for Williams". BBC Sport. Retrieved 9 September 2018. ^ Gill, Pete; Galloway, James (5 July 2014). "Nico Rosberg avoids British GP penalty for overtaking under a red flag in Practice". Sky Sports. Retrieved 9 September 2018. ^ a b Straw, Edd (4 July 2014). "British GP: Lewis Hamilton tops practice before Mercedes fails". Autosport. Archived from the original on 8 September 2015. Retrieved 8 November 2018. ^ Parkes, Ian (4 July 2014). "British Grand Prix 2014: Lewis Hamilton fastest in second practice but sees his Mercedes suffer more problems". The Independent. Press Association. Archived from the original on 8 November 2018. Retrieved 8 November 2018. ^ Noble, Jonathan (5 July 2014). "British GP: FIA promises zero tolerance on F1 track limits". Autosport. Archived from the original on 18 July 2014. Retrieved 8 November 2018. ^ Benson, Andrew (5 July 2014). "British GP: Sebastian Vettel tops wet final practice". BBC Sport. Archived from the original on 8 July 2014. Retrieved 8 November 2018. ^ Codling, Stuart (5 July 2014). "British GP: Sebastian Vettel leads Red Bull 1-2 in final practice". Autosport. Archived from the original on 8 September 2015. Retrieved 8 November 2018. ^ a b "Vettel tops wet final practice session". ESPN. 5 July 2014. Archived from the original on 7 July 2014. Retrieved 8 November 2018. ^ Smith, Luke (5 July 2014). "Rosberg storms to Silverstone pole ahead of Vettel and Button". NBC Sports. Archived from the original on 5 September 2015. Retrieved 8 November 2018. ^ a b "Nico Rosberg takes pole position at British GP". USA Today. Associated Press. 5 July 2014. Archived from the original on 6 July 2014. Retrieved 8 November 2018. ^ a b c Straw, Edd (5 July 2014). "British GP: Rosberg on pole as team-mate Hamilton finishes sixth". Autosport. Archived from the original on 5 September 2015. Retrieved 8 November 2018. ^ Richards, Giles (5 July 2014). "Jenson Button delighted after qualifying third for British Grand Prix". The Guardian. Archived from the original on 6 July 2014. Retrieved 8 November 2018. ^ a b c d "Who said what after qualifying". ESPN. 9 July 2014. Archived from the original on 9 July 2014. Retrieved 8 November 2018. ^ Benson, Andrew (5 July 2014). "Lewis Hamilton sixth as Nico Rosberg takes British GP pole". BBC Sport. Archived from the original on 7 July 2014. Retrieved 8 November 2018. ^ Hobbs, David (5 July 2014). "British Grand Prix 2014: Max Chilton Ecstatic With 'Awesome' Qualifying". HuffPost. Archived from the original on 8 November 2018. Retrieved 8 November 2018. ^ Esler, William (5 July 2014). "Pastor Maldonado sent to back of British GP grid after failing to provide fuel sample". Sky Sports. Archived from the original on 5 July 2014. Retrieved 8 November 2018. ^ "Communication at Ferrari needs improving – Alonso". ESPN. 5 July 2014. Archived from the original on 7 July 2014. Retrieved 8 November 2018. ^ a b c d e f "Qualifying Results". Formula One. 5 July 2014. Archived from the original on 8 July 2014. Retrieved 5 July 2014. ^ "Großer Preis von Großbritannien 2014 / Silverstone". Motorsport-Total. 6 July 2014. Archived from the original on 8 November 2018. Retrieved 8 November 2018. ^ a b c d e f g h i j k Hodges, Vicki (6 July 2014). "British Grand Prix: as it happened". The Sunday Telegraph. Archived from the original on 6 July 2014. Retrieved 8 November 2018. ^ a b "Lewis Hamilton wins incident-filled British GP to boost title bid after Nico Rosberg fails to finish". The Advertiser. Agence France-Presse. 7 July 2014. Retrieved 6 January 2019. ^ a b c d e f g h i j k Barretto, Lawrence (6 July 2014). "British Grand Prix as it happened". BBC Sport. Archived from the original on 7 July 2014. Retrieved 8 November 2018. ^ a b c d e f g h i j k l m n o p q r s Hughes, Mark (7 July 2014). "2014 British GP report". Motor Sport. Archived from the original on 13 July 2014. Retrieved 1 April 2018. ^ a b c d e f g h i j k l m n o p q r s t u Elizade, Pablo; Beer, Matt; Noble, Jonathan; Straw, Edd; Anderson, Ben; Mitchell, Scott (6 July 2014). "As it happened: Sunday - British Grand Prix". Autosport. Archived from the original on 9 July 2014. Retrieved 9 September 2018. ^ a b c d Harden, Oliver (6 July 2014). "Kimi Raikkonen's Crash: Analysing Freak Red Flag Incident at 2014 British GP". Bleacher Report. Archived from the original on 12 July 2014. Retrieved 8 November 2018. ^ a b c d de Menezes, Jack (6 July 2014). "F1 British Grand Prix: Race red flagged on opening lap after heavy crash for Kimi Raikkonen". The Independent. Archived from the original on 23 November 2014. Retrieved 6 January 2019. ^ Benson, Andrew (9 July 2014). "British Grand Prix: Max Chilton has lucky escape in Raikkonen crash". BBC Sport. Archived from the original on 20 November 2015. Retrieved 6 January 2019. ^ a b "Kimi Raikkonen's dramatic first-lap crash halts British Grand Prix". The Guardian. Press Association. 6 July 2014. Archived from the original on 9 September 2014. Retrieved 6 January 2019. ^ a b c Esler, William (6 July 2014). "2014 British Grand Prix – Driver reaction". Sky Sports. Archived from the original on 7 July 2014. Retrieved 6 January 2019. ^ a b c d e f "FIA post-race press conference – Great Britain". Formula One. 6 July 2014. Archived from the original on 9 July 2014. Retrieved 6 January 2019. ^ Benson, Andrew (17 July 2014). "Kimi Raikkonen fit for Germany after Silverstone crash". BBC Sport. Archived from the original on 20 October 2018. Retrieved 6 January 2019. ^ Collings, Tim (8 July 2014). "Lauda: 'Rules-heavy F1 drives me mad'". Wheels24. Archived from the original on 6 January 2019. Retrieved 6 January 2019. ^ Anderson, Ben; Mitchell, Scott (6 July 2014). "British GP: Massa says Raikkonen could have slowed to prevent crash". Autosport. Archived from the original on 6 January 2019. Retrieved 6 January 2019. ^ Noble, Jonathan (10 July 2014). "FIA rejects claims that it should have punished Raikkonen for crash". Autosport. Archived from the original on 18 September 2015. Retrieved 6 January 2019. ^ a b Anderson, Ben (6 July 2014). "British GP: Fernando Alonso knew Sebastian Vettel would beat him". Autosport. Archived from the original on 6 January 2019. Retrieved 6 January 2019. ^ McNish, Allan (8 July 2014). "Fernando Alonso-Sebastian Vettel duel was F1 at its best – McNish". BBC Sport. Archived from the original on 15 July 2014. Retrieved 6 January 2019. ^ Medland, Chris (6 July 2014). "F1 British GP: Gutierrez penalised for Maldonado clash". Crash. Archived from the original on 6 January 2019. Retrieved 6 January 2018. ^ "2014 Formula 1 Santander British Grand Prix – Race Results". Formula One. 6 July 2014. Archived from the original on 8 July 2014. Retrieved 6 July 2014. ^ a b "Britain 2014 - Championship • STATS F1". www.statsf1.com. Retrieved 14 March 2019. Wikimedia Commons has media related to 2014 British Grand Prix. This page was last edited on 18 April 2019, at 23:11 (UTC).